Christoph Graupner (1683–1760), Hofkapellmeister in Darmstadt, gehörte zu den bekanntesten Komponisten des 18. Jahrhunderts. Die große Anzahl der Werke stand bisher einer Erfassung in einem thematischen Werkverzeichnis im Wege; das 2005 erschienene Graupner-Werke-Verzeichnis (Instrumentalmusik) stellt deswegen eine Pioniertat in der Graupner-Forschung dar. Neben den Nachweisen der Quellen, der bereits vorhandenen Noteneditionen und Tonaufzeichnungen sowie Literaturstellen für jedes Werk gewährleisten diverse Register (u.a. der Satztitel und der verwendeten Instrumente) einen schnellen Zugriff unter verschiedenen Gesichtspunkten. Erstmals wird eine kritische Trennung zwischen den nachweislich authentischen und den zweifelhaften oder sogar fälschlich zugeschriebenen Werken vorgenommen. I‘m a sucker for thematic catalogues: I like to see a composer‘s output identified and encapsulated into the visual equivalent of soundbites. Just as at an audition, one can often separate sheep from goats after a bar or two, so the incipit of a piece can tempt (though I‘d be reluctant to ignore one just because it began, for instance, with a couple of E flat chords and a meandering round the triad). A particular virtue of this catalogue is the fullness of the incipits: they are not as long as, for instance, BWV, but they are often on several staves making it possible to see the texture at a glance. And interesting scorings there are. The book has just fallen open at entry 449, an Ouverture for 3 chalumeaux and strings including movements entitled Le Desire, Rëjouissance and La Speranza. Taking this entry as sample, the title is in standardised German: Ouverture für 3 Chalumeaux, 2 Violinen, Viola und B.c. ; the orthography of the source (including ascription) is given in the comments after the incipits, followed by the names of instruments not included in the heading, in this case flute and oboe in the two amorous movements. The movements are Iisted and numbered in the headings, but the numbers are not repeated within the incipits: an incipit that is not a separate movement can be identified only by noticing that it‘s staves are not grouped with a bracket; numbering would help the less observant. The annotations begin with the sources. Details of the way the score is written are specified: the notation of the timps, continuo instruments named, the clefs of the chalumeux parts (though they are preserved in the incipts): I love the consonant-grouping xschl in Chalumeauxschlüssel. The dates various scholars have assigned each work are stated, along with other listings and the RISM document number. This is supported by a variety of indexes: of MSS (almost invariably at Darmstadt), of instruments (an unusual feature, extremely useful for programme planning), and movement titles with a parallel column of German translations. Thematic catalogues must be laid out in an obvious way, since their users do not expect to have to spend time reading through an introduction, perhaps in an incomprehensible language, to find the information they are seeking. This passes that test well. The numbering system is the way most catalogues reach the public eye. Of late, the fashion has been to divide the oeuvre into broad sections (e.g. TWV 55 for Telemann‘s Overtures) then indicate individual works by key and number. This has the advantage that newly-discovered works can be slotted in without disrupting the system. GWV has preferred a simple numbering system; there are gaps, though they are accidental since work-categories are allocated in batches of a hundred (except that sinfonie run into a second hundred) and there are plenty of unused numbers. 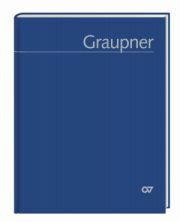 But these are out of the key sequence by which items are arranged within each group, so we hope that the editors have tracked down every single Graupner work. Nothing is said about the classification and numbering of vocal works - around 1450 cantatas as well as a few operas. The appendix of mis-attributions surprisingly has the theme of The Harmonious Blacksmith in G (GWV 904), but is the theme Handel‘s? Oswald Bill has helped many editors in the search for materials at the recently-renamed Universitäts- und Landesbibliothek Darmstadt. This catalogue will no doubt increase the number of requests for photocopies to the library, though the information will enable him to refer to this well-devised and executed catalogue to satisfy many requests. Its publication is a sign of the increased status of Graupner (1683-1760) as a composer: who would have thought a decade or so again that there would be so many recordings of his music. They are listed here, even though this element in the catalogue will need updating more often than any other. Such catalogues need to be kept up-to-date on a web site, if anyone can be found with the enthusiasm of, say, Richard Turbet with his continual updating of Byrd biblio- and discography. [...]Dieses Lebenswerk wissenschaftlich aufzuarbeiten, hat sich der ehemalige Leiter der Musikabteilung der Darmstädter Universitäts- und Landesbibliothek, Oswald Bill, immer wieder zur Aufgabe gemacht, und er hat dies - zusammen mit dem Musikwissenschaftler Christoph Großpietsch - am Ende seiner Dienstzeit mit einer Pionierleistung gekrönt. Das vollständige Verzeichnis sämtlicher Instrumentalwerke Graupners liegt jetzt vor. Gefördert von der Deutschen Forschungsgemeinschaft (DFG), konnte so eine umfangreiche Dokumentation entstehen, die dem an Graupners Werken Interessierten ein unverzichtbares Nachschlagewerk bietet. Es enthält alle wichtigen Angaben zu den verschiedenen instrumentalen Gattungen, Bezeichnungen der einzelnen Sätze und verwendeten Instrumente ebenso wie umfangreiche Notenbeispiele (Incipits), und verzeichnet zudem alle modernen Notenausgaben sowie Schallplatten- sowie CD-Einspielungen. Eine Fundgrube nicht nur für den Wissenschaftler, sondern auch für den ausübenden Musiker, die darüber hinaus optisch ansprechend und übersichtlich gestaltet ist.